Live like locals in the neighborhoods that give the city its charm. We’re certainly not going to send you to Fisherman’s Wharf, and we’re not even going to suggest Union Square. Instead, head to the classic neighborhoods where you can explore for blocks, shop at one‑off boutiques, dine and sip at chef-driven cafes, and stay at charming, small hotels where you won’t feel anonymous. With nonstop flights from John Wayne Airport for less than $200 round trip, San Francisco is an easy weekend destination that doesn’t require burning a vacation day. The blocks surrounding Hayes and Octavia are gems. This bakery and classic candy shop was designed with charm overload even before the Instagram age. The macarons and layer cakes are particularly photo-worthy. Named for the community activist who championed its creation, this green space is the perfect spot to grab a snack and rest your feet. 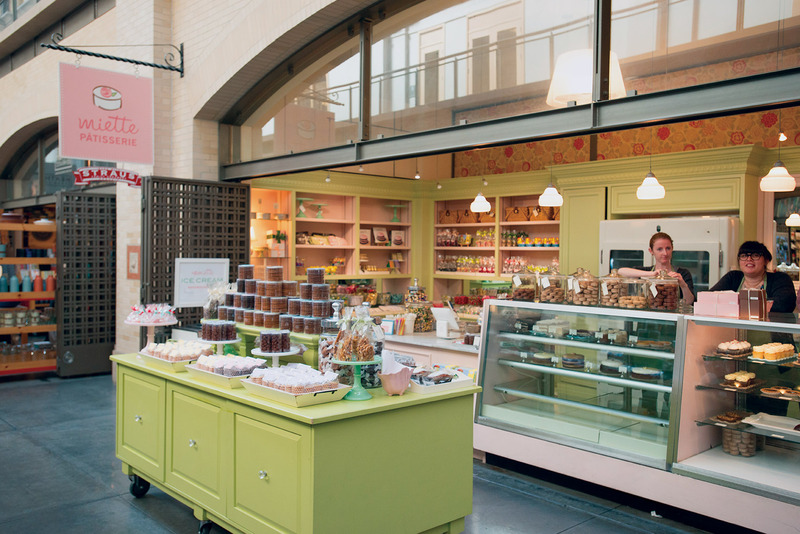 Breads and pastries are baked on-site daily. Try the monkey bread and pretzel croissant. Grab a table on the cozy back patio and eavesdrop on venture capitalists making their next deal. Don’t miss Linden Street, really an alley by most city standards, where you’ll find a pocket location of this local favorite coffee roaster. Stock up on whimsical cards, party supplies, and housewares. Your gift-giving inspiration is here. 24th Street is the artery to explore in this tight-knit ’hood. 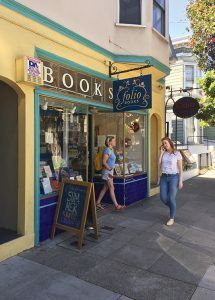 San Francisco is lucky to be studded with independent booksellers. The thoughtful staff picks at Folio serve as bookworm inspiration. Go for the local cheese and mushrooms you can’t source from O.C. farm stands. Get a quick education from vendors, sample, then load up on Saturdays from 8 a.m. to 1 p.m. This lifestyle shop features carefully curated classics, many with a wink of irreverence. There’s also a strong selection of cookbooks from prominent local chefs and bakers. Call this area NoPa or call it Western Addition—just don’t miss it. It’s the neighborhood grocer that spawned the famous ice cream—get yourself a scoop of salted caramel at the Bi-Rite Creamery counter. There’s also an enviable selection of cheese, chocolate, and prepared foods. This bustling second-floor space is home to tasty Italian food made from local and seasonal ingredients. Try the supplí, a fried rice ball, as a lead-in to the pappardelle al ragu. The lively bar has inventive cocktails and a full menu if you don’t score a reservation. A short stroll off Divisadero, tourists collect in the southeast corner for selfies with the famous row of Painted Ladies. Locals gather to lounge on the grass with their pups, eating from the assembled food and coffee trucks. Explore the ’hood known for the city’s Billionaires Row. Take in the surrounding luxury real estate at a leisurely pace, or get your heart rate up like the locals who will otherwise lap you. Either way, the gorgeous setting takes the sting off the calorie burn. 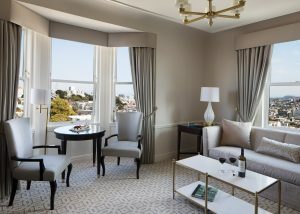 A 2017 renovation revealed a bright and genteel interior, with views looking out to unmistakably San Francisco rooftops. Rooms start at $377 and include a breakfast buffet of pastries, cereal, and fresh fruit.